Spontin is a village on the Bocq River is situated between Dinant and Crupet. It is reputed for its castle and for its mineral water, lemonades and syrups. In the 19th century, Spontin's water was so renowned that in 1895 the Belgian government built an 80 km aqueduct (actually more of a pipeline) from the Bocq in Spontin to Brussels to provide drinking water for the city's booming population. The pipeline ran under the Sonian forest, all the way to the municipalities of Ixelles, Saint-Gilles, Saint-Josse and Schaerbeek. A statue of the 'Bocq goddess' by Jeff Lambeaux, standing in front of Saint-Gilles' town hall, commemorates this facet of Brussels' history. There is also a Rue du Bocq in Auderghem. The Castle of Spontin was first established as a single keep in the 12th century. It was then a fief of the provostship of Poilvache. 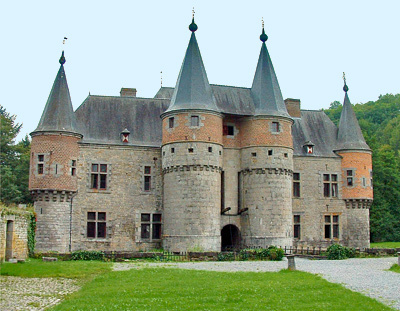 Spontin Castle played a key role in the 13th century Guerre de la Vache (War of the Cow). The castle was first owned by the powerful Beaufort family, then changed hands a few times before passing to the dukes of Beaufort-Spontin in 1747, which still own the castle nowadays (although they now reside in Austria). The present keep and gatehouse date from the 13th century, while the main building is from the 14-15th century, with some addition from the 16th century. The architectural style, resembling very much that of Crupet's castle, is typically Mosan, allying bluestones and bricks to perfection. The four towers of the gatehouse and the wide moat are especially noteworthy. Main entrance to the Castle-farm of Spontin. The castle is no longer open to the public, but can still be seen from outside. 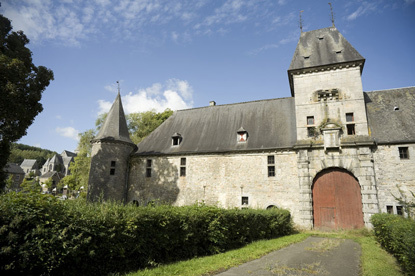 The beer brewery known as the Brasserie du Bocq is only a few kilometers from Spontin. It was founded in 1858 and brews several of Belgium's most famous beers, such as the Blanche de Namur, La Gauloise, St Benoit, Triple Moine, Saison Regal, Regal Christmas and Deugniet (=> see list of Belgian beers). The Blanche de Namur hwas voted best wheat beer and best grain only wheat beer in the World Beer Awards in 2009, and Europe's Best Belgian Style Witbier in 2012, among others. Tthe Brasserie du Bocq's Gauloise Amber was rated highly recommended strong pale ale. By car, take the exit 19 for Spontin on the E411 (Brussels-Luxembourg) and continue for about 3km for Spontin or 6km for the Brasserie du Bocq. Bus 128a running between Ciney and Yvoir (both connected to Namur and Brussels by train) passes through Spontin.